Picturing Disney: Hold onto your britches on Big Thunder Mountain RR! 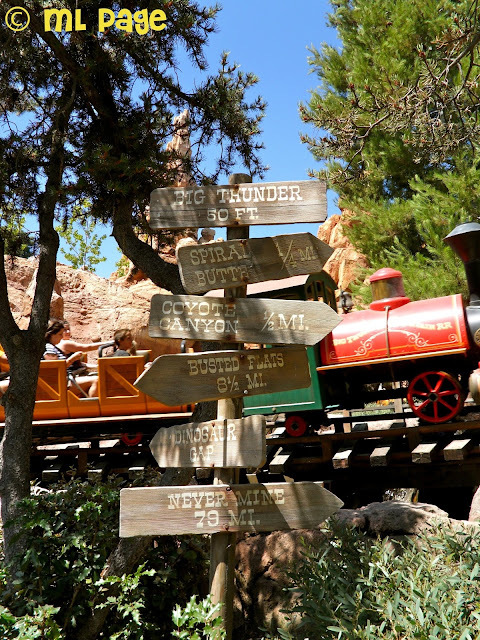 Hold onto your britches on Big Thunder Mountain RR! There is just something I love about snapping a pic of ride vehicles in motion. This particular day on my trip my husband and I rode Big Thunder Mountain Railroad at least a half dozen times. We were able to go two in a row in the afternoon and then multiple times during Fantasmic. We are convinced this ride is faster in Disneyland than in Disney World and had a great time. Photo Tip: When you are in a great area for a shot of a sign or track hold tight and with a steady hand hit your shutter when the vehicle enters your frame-- often even if there is some blurring it will make for a pretty sick picture!